Hello. 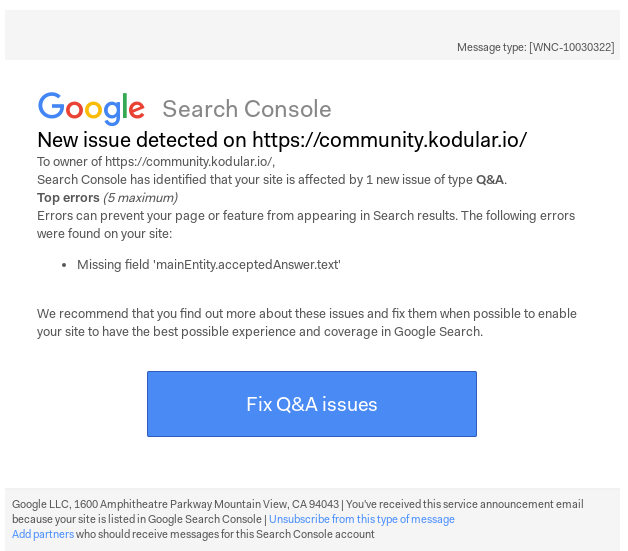 Currently, we are getting this message in our Google Search Console. I’m not entirely sure what it means, but I feel it’s related to the solved plugin. Can I get more insight on what this is? A fix? Are the running the latest solved plugin code? There was an update just over a week ago to fix support for Q&A structured data. When I check random pages here on Meta, there are no Q&A page errors. If the topic is solved, Q&A shows no errors. If the topic is unsolved, it shows an error that there is no acceptedAnswer (as you’d expect). If the topic is in a category without solved enabled, Q&A type doesn’t show up in the structured data test. 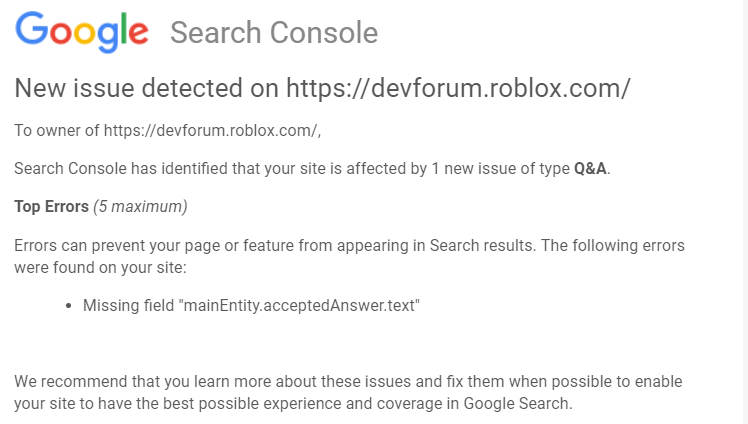 Once you’ve confirmed that you’re fully up to date, if it’s still showing errors we’ll need to see one (or more) of the URLS giving errors so we can look into it. I brought this to their attention and we are going to go through the process of updating it. Thank you! Let us know how you turn out, we do want to fix it if there’s something wrong here! I’ll ask you the same thing as Boyned//Kampfkarren, can you share a one of the URLs Google is erroring on? Can you confirm that your site (and the solved plugin) are up to date? Sorry, red tape means that it’s hard for me to know if we’re updated or even if we’re still getting it, I’m just echoing what I’m being told. I’ll ask my team. Can you confirm that your site (and the solved plugin) are up to date? Are you still seeing these errors? I’ve kept an eye on this, and cannot reproduce it. I haven’t heard anything, so I’ll assume yes. Thanks!